1 Radio: An ‘Invisible’ Medium? Initial reflections on radio as a ‘blind’ or ‘invisible’ medium from the 1950s and 1960s have described the medium’s imaginative power as ‘it cannot be seen other than inside the mind of the listener’,5 often in relation to darkness. For instance, radio producer Jim Harmon argued in 1967 how radio drama was unprecedented in its ability to explore and exploit ‘that purity of darkness, that blank slate of imagination’,6 whilst radio and television director Donal McWhinnie described radio’s imaginative power in 1959 as ‘(f)or the world of visual detail which the listener creates is a world of limitless dimension; they exist in a world which is largely dream. The radio performance works on the mind in the same way that poetry does; it liberates and evokes.’7 Informative and factual radio content has been described as asserting a similarly ‘imaginative’ power. The relationship between radio and television has generally been considered as a one-way flow of influence from radio to television. Indeed, the fact that radio broadcasting put down much of the groundwork for television forms a substantial part of Andreas Fickers’ argument that television, upon its arrival in Europe, represented a ‘conservative revolution’ from a material, institutional and programming and discursive perspective.10 From a material perspective, despite the ‘interpretive flexibility’ of the medium,11 television has followed radio’s technical path into a broadcasting model of transmission, and very explicitly took up the – both real and imagined – place in domestic space that radio had conquered decades before. In fact, in doing so, television even followed radio’s path from a more public medium listened to collectively in public spaces, to a private medium largely associated with private homes. These material legacies from radio were aided in no small part by the speed with which television was quickly grafted on to the institutional basis of radio broadcasting, which was for the most part developed and embedded in Europe in the same public service institutions and infrastructures as radio. So radio has told us much about television - but what can film and television tell us about radio? The literature that explores the visual meanings of radio is dominated by studies that focus on the moment of its arrival of a mass medium from the turn of the twentieth century onward.12 This has both intellectual and practical reasons. On an intellectual level, the moments of initial design and social embedding are of course the core moments when the meanings of a technology become fixed, often in relation to other media in the ‘mass-media ensemble’.13 Furthermore, it stands to reason that before the general public actually owned radio sets, people became acquainted with the medium via other media, including visual advertising and other visual and print sources. On a practical level, much like in the early years of television, a good deal of early radio was transmitted live – meaning that the actual sound sources for early radio tend to be thin on the ground and, up until recently, somewhat difficult to access. Visual and print sources thus play a perhaps disproportionate role in our understandings of the early decades of radio, but this attention falls off considerably where sound documents are available. For their part, literature that draws on visual sources to explore the transformation of radio into a portable device that formed part of a burgeoning youth culture, tends to focus on advertising, and in particular popular press.14 Television programmes and other audiovisual forms such as newsreels, on the other hand, are very seldom considered as sources. We argue that digitized television content can provide rich audiovisual sources to explore the imagining and documenting of this phase in radio’s history. The EUscreen portal offers free online access to thousands of items of audiovisual heritage, with clips that provide an insight into the social, cultural, political and economic events that have shaped the twentieth and twentieth centuries, selected by broadcasters and archives from all across Europe. As well as chronicling important historical events, the EUscreen portal allows different users – academics, teachers, media professionals, media artists, general users – to explore television programmes that focus on everyday experiences. The portal was built by a consortium of European audiovisual archives, public broadcasters, academic and technical partners. The materials on the EUscreen portal are thus pre-selected by these professional institutions with a focus on specific historical topics, resulting in curated, high quality content. We were then able to create a collection of relevant videos on the MyEUscreen homepage, by means of the simple search query ‘radio’. MyEUscreen is a personal and interactive homepage as part of the EUscreen portal, where users can save and share bookmarked (‘favourite’) content, make audiovisual collections, create video posters, and add media annotation or audiovisual annotation to videos, in the form of ‘in-clip’ or ‘in-item’ bookmarks. In taking EUscreen and its digitized audiovisual materials as a source (and where relevant, pointing to connected audiovisual sources on other online media archives), we place emphasis on visual representations and narrative constructions. In contrast to the pure focus on radio sound as ‘blinded’, EUscreen allows what might be called a (productively) ‘deafened’ approach to radio history, which we argue partly enables this type of transnational comparative research by supporting at least an initial enquiry that is less dependent on language skills (although the EUscreen portal does overcome some language barriers by translating metadata descriptions, and offering subtitles and multi-language search). Following our initial reflections on EUscreen as a research tool and research corpus, we carry out a comparative audiovisual analysis of selected cases representing, documenting and imagining radio as a (background) medium in relation to television’s social embedding in the 1950s and 1960s. By paying particular attention to general visualizations of the medium radio in audiovisual materials, especially factual and informative content, we were able to tease out visualizations of (1) ‘behind the scenes’ and ‘making of’ practices, including radio professions and gendered division of labour, (2) domestic contexts, and (3) broadcasting overseas and beyond nations. Finally, we offer a reflection on digitized television heritage on EUscreen as a source for comparative research and for understanding radio’s long history, suggesting how EUscreen’s aggregation of film reels and television content allows for a ‘longer’ view on the way radio has been visualized and narrativized through news, short films and informative television programmes. At the time of writing this article, the simple search query ‘radio’ generates hits on 816 videos on the EUscreen portal, apart from images, documents and audio. By far not all of these hits were relevant to the inquiry at hand, or to radio at all. In some cases, the hit appeared because ‘radio’ was part of the name of an institution on the EUscreen portal, such as ‘Radio Télévision Suisse’ (which also accounts in part for the disproportionate representation of Francophone videos in the raw sample: 194) or compound terms such as ‘radio telescope’. Using EUscreen’s filter by decade produces a breakdown in the raw sample an unsurprising breakdown there are relatively small returns for the 1930s (12 results) and 1940s (19 results), middling for the 1950s (50) 1970s (94) and 1990s (105) and two ‘spikes’ the 1960s (154 results) and the 1980s (132 results). These ‘spikes’ are arguably the most important decades in the transformations of radio – though the extent to which EUscreen’s video content currently reflects those changes is questionable. Some of the most important aspects in the transformation of radio in the 1960s are under-represented or thematised. Notably the advent of offshore broadcasters in the North and Baltic Seas16 is entirely absent, while the end of the era gets a brief mention as part of the first television programmes from the former Dutch offshore broadcaster Veronica in 1976, after their offshore activities were finally banned and they joined the public service system.17 In the 1980s content, there is very little that seems to talk about or represent the increasing commercialization of radio. However, the free radio movement, the other important institutional development at this time, does begin to take on a presence: appearing in clips from Switzerland as well as in an overly sceptical account from the public service broadcaster in Belgium. The extent to which fitting radio material is easily findable depends largely on the quality of description in the metadata. The link when the word is in the title makes it obvious, but thorough scene-by-scene descriptions, as provided by the INA in this 1959 French newsreel on ‘Youth Style’, allows us to find where radio is located within newsreels not devoted to it. Here, indeed, we see the transistor radio appear as the first of a number of audio style accoutrements (‘0:55-’1:20) to the growing youth consumption culture. Similarly, we are led to an RTÉ TV news spot Alone at Christmas (1964) where the social function of the radio in maintaining social contact is underlined. At present, sifting through such hits to discover their relevance is time consuming, but is precisely the kind of work that new digital tools for content extraction can make possible. From the raw selection, we were able to generate a non-exhaustive collection of 67 video assets, stored and shared amongst both authors using the MyEUscreen homepage tool, which formed the core of this study. One of the classic ways of ‘visualizing’ radio is taking viewers ‘behind the scenes’, to show how radio productions are made. This is often a showcase of technical competence. However, such visualizations not only give insight into production practices, but are also interesting in terms of gendered labour and broadcasting. The KRO film Uw Onbekende Huisgenoot (‘Your Unknown Housemate’, 1954), a never-aired promotion film for the KRO, plays with the ‘invisibility’ of radio and its cosy domestic embedding, even while it takes listener/viewers ‘behind the scenes’ at the KRO. Interestingly, this is done by beginning with an invisible voice of the radio - conflated with the institution of the KRO - describing where radio appears in society (see further under ‘domestication’ below). This voice is then shown as belonging an elderly man with a guitar, a personification appearing first in a radio station behind a microphone, then magically appearing in a domestic sphere, to explain to the family, somewhat paternalistically, what goes on behind the scenes.18 The radio station is portrayed above all as a high-tech place, with multiple shots of programme activity intercut with male recording engineers and directors turning knobs at consoles, issuing orders and taking care of the enormous technical work that the voice over stresses repeatedly. At the same time, however, the programme also shows the radio station as a limited site of female professionals, though their roles are, to a large extent, coded according to gender norms.19 We see women singers at various points (usually in ensembles), as well a telephone operator (‘06:17), the host of children’s programme (‘06:42), the co-host of a record request programme (‘09:12) a piano player (‘10:20), maker of school programmes (‘16:18), voice actress in a drama written by a woman writer (Nodeloos Avontuur (‘Needless Adventure’) by Hélène Swildens, broadcast December 18th 1951, (‘23:34-’25:50)). Video 1. Your Unknown Housemate, KRO 1954. Go to the online version of this article to watch the video. Openbare Omroep (Public Broadcast) (1966) which presents the Belgian VRT’s public broadcasting building at the Place Flagey square in Brussels, is a more straightforward ‘behind the scenes’ documentary, showcasing the generic bustle of an office space over the technical power and know-how of the station. People pushing telephones and paper dominate, with roles between men and women much less visually defined. The moment of focus on technology features a montage of recording technologies (‘01:36-’02:02), and while the voiceover suggests this is strongly technical work (‘How many technicians spin the records?’) the technologies do not look considerably different from that of home technologies – particularly the gramophone record, but also the ¼’ tape - plus the operators themselves are barely shown. Indeed, only when the documentary turns to television (circa ‘02:05), do broad banks of technical equipment become strongly foregrounded - and among the technicians a woman is clearly visible (‘03:27). Curiously, about the most consistently gendered technology on display throughout is the typewriter, which is only shown being operated by women. Video 2. Public Broadcast, VRT 1966. Go to the online version of this article to watch the video. 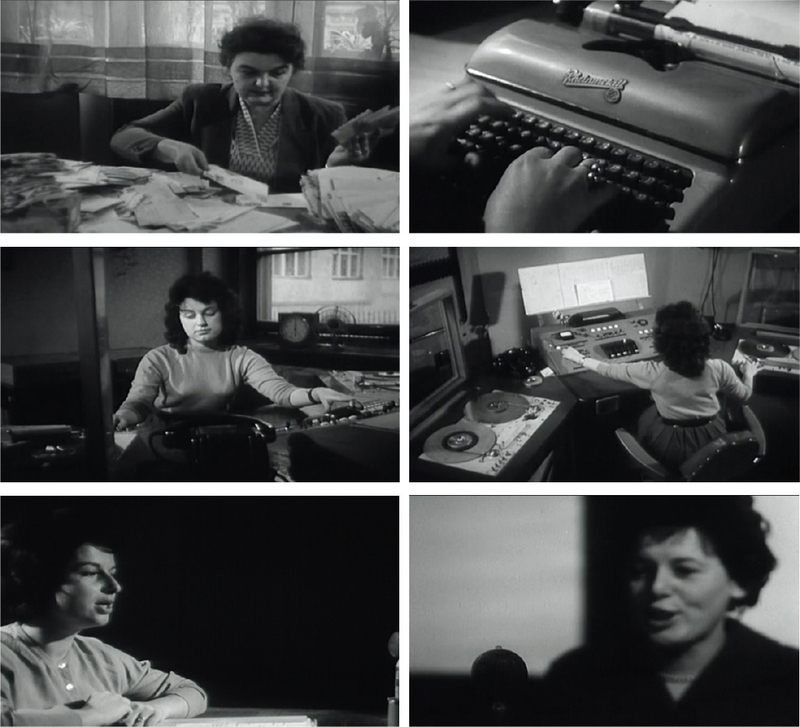 In a Czechoslovakian film reel from 1961, radio’s behind-the-scenes activities are visualized in the context of overseas broadcasting: including office work, telephone conversations, the hustle and bustle of office work (such as collecting and reading letters – and even gifts – from listeners), to the work of radio news readers in the studio. Parts of the video underline sharp contrasts in production practices – for instance, activities such as typing or sorting out letters are exclusively performed by women, whilst carrying out discussions on the phone is delegated to male employees. However, large portions of the clip do show creative practices carried out by both men and women in a more or less equal manner, such as technical practices, reading letters, the creative practice of speaking to listeners in a radio studio, and research. This department for the international broadcast of the Czechoslovak Radio at this time broadcasted 30 hours a day in twelve languages, with a large listener response: every year about 50 thousand letters were delivered from all over the world. Video 3. The Czechoslovak Newsreel 25, CT 1961. Go to the online version of this article to watch the video. Such a report and its discussion on television, which is concerned with the way women are shown and used on TV and radio in Ireland, and in decision-making jobs at the institution RTÉ, contextualizes historical concerns in relation to gendered labour and gendered representation in/on radio and television, as well as televisual reflections on TV and radio’s production and representational practices. Video 4. Women in the Media, RTÉ 1980. Go to the online version of this article to watch the video. Whilst for instance news programming and film reels would often foreground prominent male radio personalities and figure heads,24 the visualization of such ‘behind the scenes’ activities and related concerns and considerations gives further insight into the ‘hidden professions’ and gendered labour division related to radio’s production practices. Here, the real ‘work’ of what is meant to sound effortless, is made visible. In offering visions of radio production as a gendered practice, many of the portrayals of radio, including the ‘behind the scenes’ documentaries also thematize the domestic ideologies of radio - ironically at a point when they were beginning to shift in the post-war era. In Here’s Hilversum… The AVRO discussed above, though mostly shot ‘behind the scenes,’ the opening sequences portray radio’s work of synchronization of an ‘imagined community’ and everyday ‘normality’ one that is largely determined by the comings and goings of men from the domestic sphere.25 A montage of shots alternating between clocks and men at telephones and microphones, before finally cutting (‘02:07) to a domestic interior and a decidedly middle-class husband at wife at breakfast, where the radio’s time signal sends the man off to work. A series of shots of people entering the workplace then brings the drama back to the AVRO - behind the scenes as a workplace. 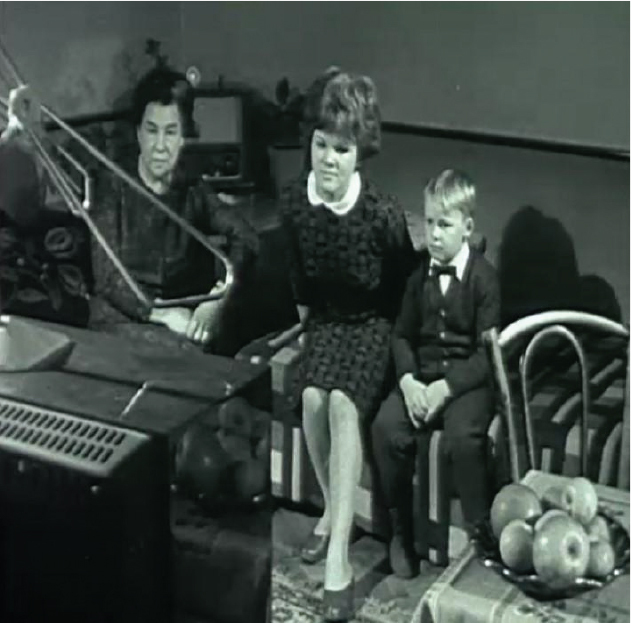 In an Austrian clip for school television titled ‘Radio-Television’ (1966) presenting a history of television, radio appears as mostly a step towards television. The English title, which created the search hit, seems to be something of a mistranslation: the original German title Rundfunk-Fernsehen would perhaps have been better rendered as ‘television broadcasting’. But to an extent, this mistranslation captures the uncertainty around the two terms, and points to the genealogical imagination of television as radio with pictures, captured also in Dutch in the term beeldradio (‘image radio’) and in the German word Bildfunk which was used during the development phases of television. In the opening sequence of the clip (‘00:50-’01:05), television ‘quotes’ itself with a close-up on a television set. 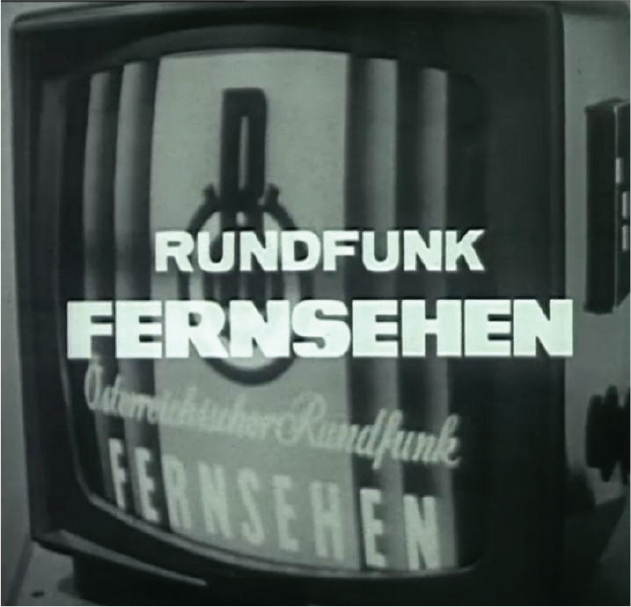 The title ‘Rundfunk Fernsehen’ (Figure 2) is echoed in the picture on the television screen (‘Österreichischer Rundfunk: Fernsehen’) and the voiceover announcement from the television set (‘This is the Österreichischer Rundfunk with its television programme’). This a subtle shift of meaning from the programme’s title: Rundfunk here marks the name of the institution, and Fernsehen specifies the medium itself. Thus, while the title of the programme seems to sketch a general development of a technology, it is immediately ideologically bound up with the national institution. Video 5. Radio-Television, ORF 1966. Go to the online version of this article to watch the video. The ‘mistranslated’ title further highlights the extent to which radio is portrayed in the clip as simply being a stepping stone on the way to television. Such a narrative is inadvertently signalled in the clip’s opening, as the close-up of the television is followed by the now-classic counter-shot of a television’s-eye view of a (remarkably small) sitting room (Figure 3). This is not the suburban home from the parallel world of American television,28 but what appears to be the relatively tight quarters of a post-war urban dwelling. Just visible in the shadows behind the family – notably absent is a ‘father’ figure, whose ideological place during the hours of school television is at work, and thus outside the home – is the household’s radio. The radio can be seen but is literally relegated to the background behind the household members/viewers, who are watching the television set. This domestic establishing sequence then serves to set up a discussion of the evolution of television (in which radio is a short transitional phase (‘03:50-’04:20) before the ‘real’ experience of distant pictures could be achieved). This narrative that is also pointedly ‘domesticated’ into a national narrative with a strong emphasis on German-speaking inventors, as well as Austrian actor and director Leopold Hainisch (1891–1979), who tells of his work at the Reichssender Paul Nipkow in the 1930s. EUscreen offers a rare but valuable glimpse at a different vision of the international airwaves beyond the now-standard Cold War combat paradigm in the Czechoslovakian film reel from 1961 discussed above. As outlined, this video follows a somewhat classic trajectory for behind-the-scenes, and in particular overseas broadcasting, videos. It begins with close-ups of office work: first typing (entirely done by women), then telephone conversations, and then finally the work of speakers in a radio studio, making announcements in a number of languages. Its composition strongly resembles a compilation in the context of the 10th anniversary of the Dutch ‘Wereldomroep’ (Radio Netherlands Worldwide, 1955).34 The clip includes houses of the transmission masts in Huizen, broadcasts in various languages, a van of the ‘Wereldomroep’, and footage of the extensions of new transmission masts in Lopik. We see many identical elements, including the stacked-up letters and montage of languages. Comparing the two newsreels also highlights a strong contrast with the Czechoslovakian film reel: namely the relative absence of high technology in the latter: no transmitters underline the strength of the signal, no engineers turning unidentifiable knobs in transmission control rooms suggest technological prowess, no banks of reel-to-reel tape players accent the vast content or production of the station. As such, the clip actually erases most elements that could be seen as competition in the airwaves with the West. Instead, the clip highlights other elements: global connection and cosmopolitan competence. The emphasis comes to lie on the vast amount of correspondence, complete with folkloristic ‘souvenirs’ from other nations. The montage of announcements in foreign languages also creates a view of a country that is open to the world, but at the same time, staying in place. the clip’s closing shots, not of the world, but of antennas on the roof overlooking Prague seem not so much to present international broadcasting as reaching out, but as bringing in other countries - as a kind of tourism in reverse. Video 6. Broadcast for 10th anniversary of the Dutch ‘Wereldomroep’, Radio Netherlands Worldwide. Go to the online version of this article to watch the video. The comparative perspective that EUscreen affords shows both visual and narrative conventions around radio. The slippery position of radio transmitters between centre and periphery, and indeed between the national and the transnational, is highlighted in a newsreel about the opening of the RAI transmitter in Caltanissetta, Sicily in November 1951. The video establishes the eventful nature of the news item with images of important figures, including the Italian Minister of Telecommunication Giuseppe Spataro, arriving at the station and making speeches. These visuals are then slowly intercut with shots of the technology: first the giant antenna, the highest human-built structure in Europe at the time it was built (1965), then a map, showing its placement in Sicily. The visuals are at best vague about the geographical reach and intent of the radio station. In fact, the antenna ultimately served not only its immediate region, but also reached much of the Mediterranean, including Spain and North Africa. To a certain extent it was a kind of counter-pole to the long-established international transmitter in the Adriatic port of Bari, famous since the 1930s for its Arabic broadcasts36 – and shown briefly in this 1962 newsreel (‘03:16-’03:29) with tell-tale static sounds, also as a site of the radio receiver industry. In spite of this potential importance outside of national territory, the newsreel itself highlights for a domestic audience the new transmitter’s role in shoring up radio’s territorial function, saying it will ‘solve the radio problems of Sicily and large parts of Calabria’. Comparing this video with the other clips on international broadcasting that feature montages of voices and languages also underlines the extent to which the clip actually silences the ‘voice’ of the station. Following a montage of scenes building up to a view of speakers in the studio, the clip stops just before they begin to speak, and thus avoids the politics of accent and dialect in claiming the airwaves over Southern Italy as national territory. Video 7. Implementing and developing radio in Sicily, LUCE 1951. Go to the online version of this article to watch the video. Finally, a clip celebrating the 5th anniversary Deutsche Welle TV offers us in visual imagery a review of the beginnings of DW-TV, after taking over RIAS-TV (Rundfunk im amerikanischen Sektor, Broadcasting in the American Sector). Deutsche Welle-TV has been on air since April 1st 1992. Its opening makes the transition clear: focussing on a classic-model radio, in which ‘television’ pictures begin to appear – converting it visually into a TV set. From there, the scenes that make up its first minute take up a familiar pattern: the grand opening of the new institution; a tracking shot in through a building to show broadcasters at work; this is then followed by shots that emphasize the technology. Here the transmitter antennas are replaced by rockets, as satellites and their footprints represent the global reach. The montage of languages is seen but not heard in an infographic. While focussing on television, this clip, too, follows and documents many of the same narrative and visual conventions used for international broadcasting. Video 8. 5 years DW-TV, Deutsche Welle 1997. Go to the online version of this article to watch the video. Radio has been described as a ‘resilient medium’ – including in the digital era. Research from the ECREA Radio section have argued that as newer media (like, importantly, television) have challenged radio’s once dominant position as a ‘means of simultaneous communication with large and unseen audiences’, the medium has adapted to those challenges over its long history.37 In this essay, we explored EUscreen (and where relevant, pointed to connected materials on YouTube and Open Images) as a source of information regarding radio’s long history. The essay has positioned itself as a ‘bottom-up approach’ using audiovisual media on the EUscreen portal as a source for visual representations and narrative constructions. Our analysis has teased out visualizations of domestic contexts, ‘behind the scenes’ and ‘making of’ practices, radio professions and gendered division of labour, and broadcasting overseas and beyond nations. We have done so across different countries in Europe and different timelines, specifically relating to representing, documenting and imagining radio as a (background) medium in relation to television’s social embedding in the 1950s and 1960s. EUscreen’s potentialities underscore that transnational, comparative research in this respect is possible, and also offers deeper reflections on how digitalization can help with some of the ‘problems’ of doing this type of research. Our analysis has also created opportunities for source criticism, especially regarding both availability and absence on the EUscreen portal. Taking the discussed limitations into account, we have been able to explore the visual meanings of radio by means of transnational sources that have imagined its history for broad and diverse audiences, but also have documented its practices – including sources that have never been aired, like the KRO promotional film Uw Onbekende Huisgenoot (‘Your Unknown Housemate’, 1954). In addition to our previous reflections on availability, and the limited availability of sources from/on certain periods of radio’s long history on EUscreen, the portal is also a ‘living’ archive in the sense that content may disappear - for instance, the Swedish Royal Library’s recently removed its content from the portal, thus costing access a segment introducing Melodiradio, the first major radio programming effort from a public service broadcaster to address the commercial competition from offshore broadcasters.38 Such archival content can contribute important alternative perspectives to other representations of pirate offshore broadcasting practices. But even in their ‘invisibility’, however, the fact that the metadata is retained on EUscreen alerts researchers to the presences of such sources and in so doing opens, rather than closes, research opportunities. As a prime example of digital humanities research work, the curated, pre-selected collection on the EUscreen portal (with the MyEUscreen personal and interactive homepage as a tool for collecting, documenting and annotating sources) aids in the analysis and contextualization of more complex datasets, taking important first steps in helping to diminish the risks of comparative work – which are carrying comparisons too far by over-selection, simplification, generalization or obsession39, as well as to a certain degree overcoming language barriers by translation of metadata descriptions, subtitles and multi-language search. Researchers should still take ‘enthusiastic caution’40, but real possibilities for such comparative work in the digital age are being exposed, helping to identify meanings in a larger cross-cultural dataset and providing rich, detailed and complex interpretations. Although digital television heritage is increasingly recognized as a rich object for analysis, there is a scarcity in researching audiovisual cultural memory from a European comparative perspective41 and television as a constellation of dynamic, cross-media storytelling practices.42 Using digital humanities tools like EUscreen, researchers are now able to develop methods that include and venture beyond the understanding of practices by public service broadcasters and archival institutions in local contexts. The study of audiovisual sources and their use in the new media landscape (which for both radio and television can include very recent, previously broadcast, online and digital sources) can then help to construct new discourses of audiovisual media, including, as we have shown, radio history. Radio in the digital age is venturing from a sound only, verbal medium, to a visual medium, too – think of in the digital era for instance webcasting on the internet, and the use of graphic interfaces for the distribution of digital radio content.43 In line with more contemporary reflections on television as a dynamic, ‘multi-platform’ and hybrid memory practice in the current age of convergence,44 and the visualization of radio as a medium itself, the authors wish to urge EUscreen to take up a more multi-media approach to the collecting, curating and contextualization of audiovisual sources – to able to keep performing this important function in the digital age. Alexander Badenoch is the Netherlands Institute for Sound and Vision Professor of Transnational Media at the Free University of Amsterdam, and Assistant Professor in Media and Cultural Studies at the University of Utrecht. He was researcher on the HERA collaborative research project Transnational Radio Encounters, and part of the team of the award-winning online listening and exhibition platform Radio Garden. He is President of the Studienkreis Rundfunk und Geschichte, the German broadcasting history society, and co-coordinator of the Women’s Radio in Europe Network (WREN). He is author of Voices in Ruins: West German Radio Across the 1945 Divide (2008), and co-editor, with Golo Föllmer, of Transnationalizing Radio Research: New Approaches to an Old Medium (forthcoming 2018) and with Andreas Fickers and Christian Henrich-Franke, of Airy Curtains in the European Ether: Broadcasting and the Cold War (2013). Berber Hagedoorn is Assistant Professor Media Studies at the University of Groningen. Hagedoorn specialises in Media and Cultural Studies and working with digitized audiovisual heritage, and studies the representation of mediated events, participatory media, multi-platform storytelling and cultural memory. She is Vice-Chair of the ECREA Television Studies thematic section, organizing cooperation for European research and education into television’s history and future as a multi-platform storytelling practice. Her Digital Humanities experience includes the European Best Practice Networks VideoActive and EUscreen, her 2016–17 Research Fellowship at the Netherlands Institute for Sound and Vision in Hilversum studying audiovisual representations of historical news events in the context of DIVE+, which builds an innovative approach for the exploration of digital heritage via linked online collections, and currently her CLARIAH Research Pilot Narrativizing Disruption (with dr. Sabrina Sauer), which studies how users of the media archive and audiovisual sources use and create narratives to understand media events, and how exploratory search supports such narrative generation. Hagedoorn has published in amongst others Continuum: Journal of Media & Cultural Studies, Studies in Documentary Film, Rundfunk und Geschichte, Tijdschrift voor Mediageschiedenis and Historical Journal of Film, Radio and Television (https://berberhagedoorn.wordpress.com).